Despite many of my Monday Munchies being on the comfort food side of the healthy spectrum, I actually am a rather large health nut. And recently I have gotten on board with kale. I have resisted it for some time now. I’m not sure if it was the texture, the taste or just the visual look that gave me faint reminders of spinach, which I can’t stand cooked, raw, or otherwise. I am no Popeye and I would give in to Bluto every time if my only other option was spinach. Exception – drown it in cheese and artichokes in the form of dip so there is no discernible taste of spinach. But I digress. As I said, I am on board with kale and I am trying to figure out different ways to incorporate it into my everyday meals. 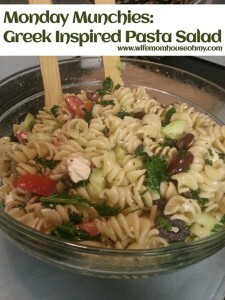 One inspiration was today’s Monday Munchies – Greek Inspired Pasta Salad. I happen to love Greek food and flavors of the Mediterranean area. Give me Olive Oil (and no not Popeye’s), kalamata olives, oregano, fresh lemon juice, yummy feta cheese and, alas, garlic (long story but I am sadly allergic to garlic though I cheat since I love it so much). So when I needed a fast meal that could be cooked in advance, Greek and pasta popped into my head. This self-concocted recipe combines fresh herbs, fresh citrus, and vegetables with simple seasonings to bring a filling salad to the table. 1. Cook the box spiral pasta according the instructions on the box. Rinse when done and set aside in a large bowl. 2. While the pasta is cooking, make the dressing. Mix the lemon juice, olive oil, fresh herbs, dried garlic and onion salt in a sealable and pourable container. Shake till mixed and set aside to blend and infuse. 3. In a sauté pan or skillet, melt 1 tbsp. of butter. Add diced kale and sauté until slightly wilted and kale becomes an intense green. Set aside and let cool. 4. Dice all veggies and place them into the bowl with the pasta. 5. Add cooled kale and tomato and basil crumbled feta cheese to pasta. Mix until well blended. 6. Sprinkle salt and pepper on to salad to desired taste. 7. Add dressing and mix again until pasta and veggies are coated in the dressing. 8. Place into refrigerator and cool for 30 minutes or longer before serving. I personally love the fresh mint and oregano blended with lemon juice and olive oil that take my tongue to my favorite greek meals. Paired with feta cheese and fresh veggies, and its a match made in heaven. Not bad for an inspired idea that started in the back of my flavor palette, concocted in my mind and came to fruition in my Greek inspired pasta salad. Can we just say yum! As a note, letting the pasta salad sit in the fridge about 12 to 24 hours really infuses and blends all the flavors together for a perfect palette pleaser.